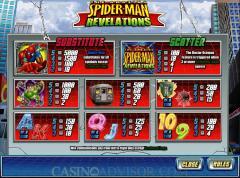 Spiderman Revelations is a video slot from Cryptologic. It has 5 reels, 25 paylines and a maximum bet of 25 coins. 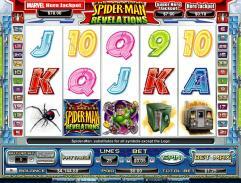 It is the second Spiderman branded slot game in the Marvel Comics series of super heroes. Spiderman Revelations portrays Spiderman’s battle against Doctor Octopus. The Spiderman is the wild symbol and The Amazing Spiderman Revelations Logo is the scatter symbol, which triggers the bonus game on the second screen. The other symbols on the reels are all associated with Spiderman. They are Doctor Octopus, the Train, the Safe and the Web. The high value cards are depicted covered with sticky spider web threads. Before starting the game players will have to choose the coin denomination by operating the arrows on either side of the coin denomination button. There are 11 options between 0.01 and 1.00 and then the denominations increase in increments of 1.00 till 5.00. Players will also have to enable up to twenty-five paylines. The paylines can be activated by operating the arrows on either side of the LINES button. Winning combinations pay only if they occur in enabled paylines. 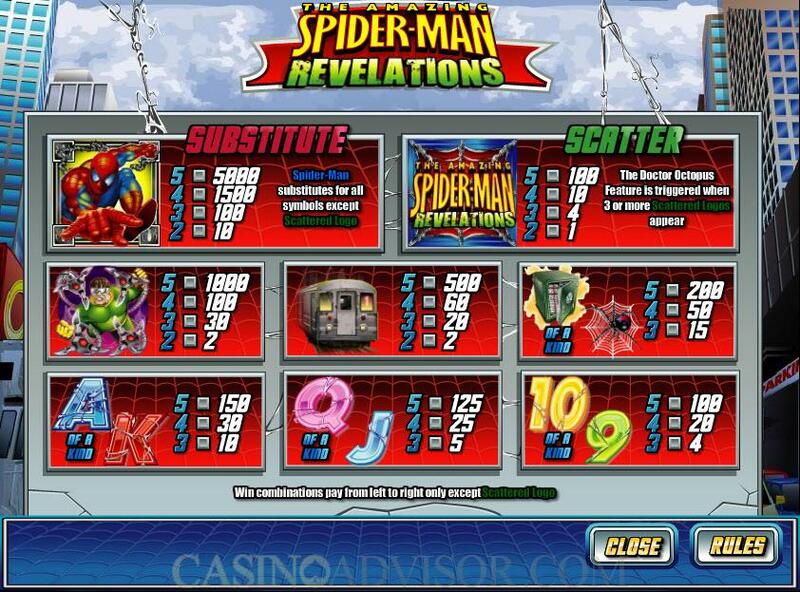 In Spiderman Revelations players can wager only one coin per payline by default. Once the settings have been completed the game can be started by clicking the SPIN button. Spiderman is the wild symbol. It doubles payouts when it substitutes to make a winning combination and offers a fixed jackpot of 5000 coins when five symbols appear in an enabled payline. Two or more scatter symbols result in scatter payouts. Five scatter symbols have a payout of 100 coins. The Doctor Octopus Feature is triggered when 3 or more Scattered Logos appear. Doctor Octopus appears on top of a train and throws a passenger at Spider-Man displaying the number of free spins and the multiplier. The player can accept the offer, save the passenger and move on to the free spins. If the offer is not acceptable the player can try again. In that event Spiderman saves the passenger and Doctor Octopus throws a new passenger with a fresh offer. The player can accept or reject this. If he rejects the offer then the final offer becomes binding. The sound and animations add realism to the bonus feature. 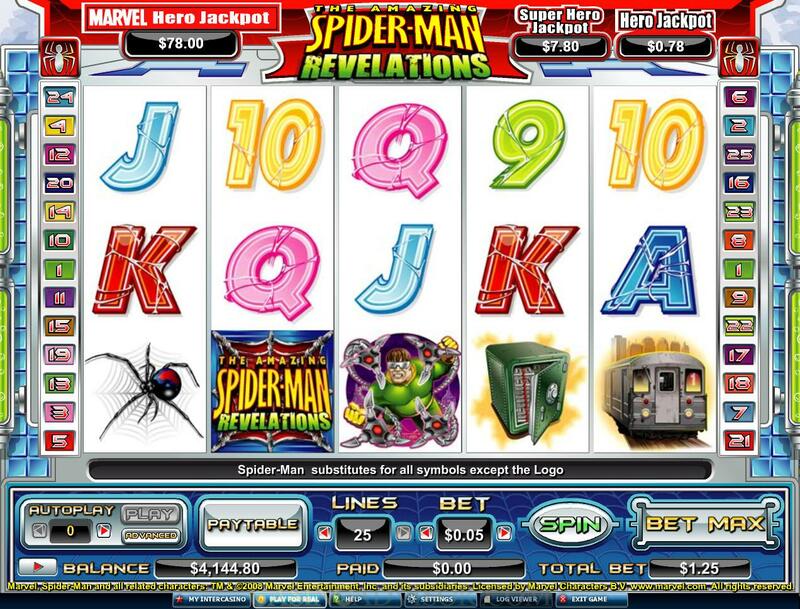 Spiderman Revelations is linked to the Marvel progressive jackpots. These jackpots are triggered randomly. No sequence of events on the reels is required. The larger the bet the greater is the chance of hitting the jackpot. The largest jackpot is the Marvel Jackpot. Next is the Super Hero Jackpot. The smallest jackpot is the Hero Jackpot. Interested in reading more detailed information about Spiderman Revelations? If so Click Here for more details.